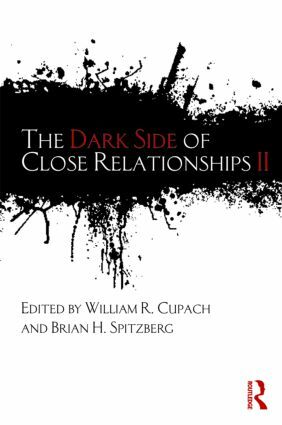 The Dark Side of Close Relationships II is a completely new and up-to-date version of the original volume published in 1998, featuring new topics and authors. The volume showcases cutting-edge work on important topics by prominent scholars in multiple disciplines. It sheds light on the paradoxical, dialectical, and mystifying facets of human interaction, not merely to elucidate dysfunctional relationship phenomena, but to help readers explore and understand it in relation to a broader understanding about relationships. As previous Dark Side investigations have revealed, negative or dysfunctional outcomes can occur in relationships even though positive and functional ones are expected, and at the same time, positive silver linings are often found in some dark relational clouds. Such nuanced approaches are needed to better account for the complexity of close relationships. A unique and provocative collection, this volume will appeal to relationship researchers in communication, social psychology, family studies, and sociology. The Meaning of Girls’ Social Aggression: Nasty or Mastery?